Arrive at Amritsar and transfers to hotel. Evening free to explore the local market. Pamper your taste buds as Amritsar is a very popular destination among foodies. Lure on the popular Aloo Paranthas, chicken, Lassi and chai of Amritsar. After breakfast, set out for a full day city tour. Begin this with the Golden Temple. Continue to Jallianwala Bagh and Durgiana Mandir. In the afternoon, visit Wagah Border to attend the Beating Retreat ceremony held before sunset (reach the border by 4:30 p.m). After this, Proceed to dine across the city market. Overnight stay at hotel. After breakfast, check out from the hotel and transfers to Dalhousie by road. On arrival, check into hotel and spend the remaining day relaxing. Overnight stay at Dalhousie. Full day at leisure. Visit Sat Dhara, Panji Pulla and Shubhash Baoli. Overnight stay at Hotel. After breakfast, check out from the hotel and proceed for Dharamshala. 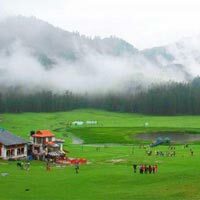 Enroute spend some time at Khajjiar. On arrival at Dharamshala, check in to hotel and rest of the day to relax. Overnight stay at Dharamshala. After breakfast, check out from the hotel and travel to Chandigarh. Check in to Chandigarh Hotel. Later in the evening, proceed to city market to have a great time shopping. Dinner and Overnight stay at Chandigarh Hotel. After breakfast, proceed for a full day city tour. Visit Rose Garden (Sector-16), Museum & Art Gallery (Sector-10), War Memorial and Bougainvillea Garden (Sector-03) and Rock Garden (Sector-1). Do not miss out on boat ride in the evening at Sukhana Lake. Overnight stay at Chandigarh. After breakfast, check out from the hotel and departure to your location.